There are hundreds of simulation games out there for everyone to play, whether it be driving a truck or running a theme park, but what if you wanted something a little different? What if you wanted to run your very own prison and customize it exactly the way you want? No need to go through all that hassle of becoming an actual warden, all you need to do is play Prison Architect! 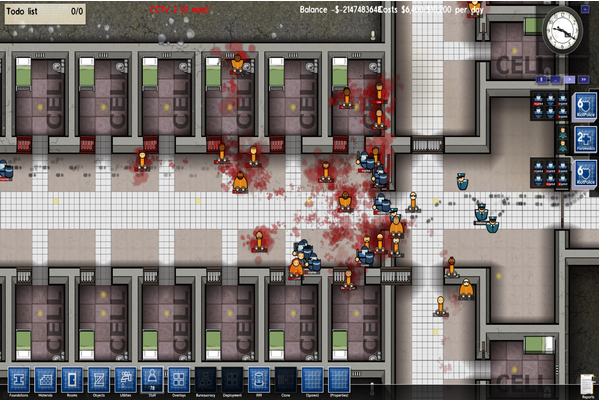 Prison Architect is still in alpha stage, and so there is still many bugs in the game, but Introversion software allow you to point out and discuss all of the bugs you find on their forums and even make jokes about all their bugs, which is reassuring considering they release a patch every single month always adding new features and fixing all the bugs. The real beauty of this game is that you require no real prior skill and you can just jump straight in, play the quick tutorial (with a clever backstory) and then enjoy! 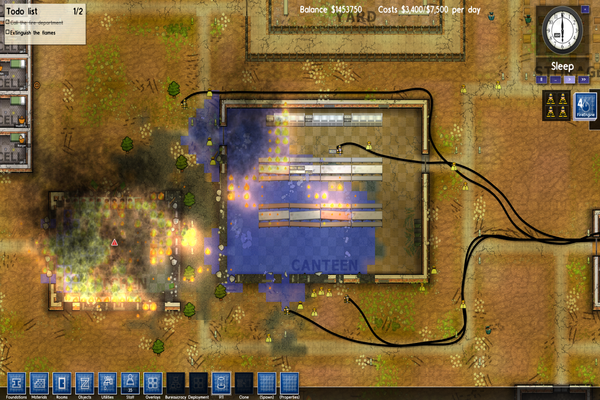 So you’ve just bought Prison Architect, you’ve completed the short tutorial and you’ve started your very own prison. First of all you’re going to get a call from the CEO (this is how you receive most of your objectives throughout the game) and I personally think it’s a good system. The first couple of trucks arrive, carrying some starting supplies such as bricks, and the second truck will arrive with your initial workforce, which I suggest you get them working straight away to maximize efficiency. You will then have 24 in game hours before the first group of prisoners arrive. Be sure to hire yourself some guards as the instructions don’t dwell on staff too much, just basic foundation requirements. You will have to setup your small initial prison and make sure your starting prisoners do not escape and are kept happy, that way you will make enough money to start construction on your maximum-security facility! When in construction mode, you layout your foundation over whatever area and size you want. Then you have the option of assigning any number of rooms to that foundation, for example, you can make your foundation 20x20 and split the foundation in two with a brick wall, then assign the top 10x10 as your holding cell and the bottom section as a shower, or anything for that matter. All buildings require certain things such as doors and for the most part power and water. This leads me to my next point which is the utilities mode; you have to build power stations and water stations so that your prison can function correctly, which involves inserting pipes that can flow to different areas of your prison. These utilities can be quite expensive, but you are given 1 of each for free with your initial supplies along with 24 large pipes, so don’t misplace them and accidentally delete them because you will have to buy them again! I have yet to employ every single available position or build every building or object as there is a large variety of possibilities when it comes to these things, which furthers your ability to customize your prison. The positions I have filled all worked quite well; the guards patrol on their own or patrol a path you want, which you also have guard dogs for this (these arrived in the latest patch). Apart from guards though you need to hire doctors, chefs, accountants, a warden and many other positions all of whom are essential to your prisons success… or failure. It is in fact possible for your prison to fail miserably and you will have to either think fast and fix it or give up and try again. It can be anything from a prisoners riot which leads to their escape, an escape tunnel from the bathrooms that you didn’t find in time, or it could even be a fire in the kitchen that causes your prison to shut down either costing you too much to fix or your prisoners escaping in all the ruckus, so be careful! Graphic and performance wise, there isn’t really a lot to talk about. The game uses really basic graphics and isn’t very demanding at all; however, if you do have a rather large prison you may experience some frame rate issues, but I believe this is a hot topic on the forums and is being worked on by the very dedicated developer. You will notice that all the prisoners and even your workforce all have a little biography card type 'thing', which will allow you to see certain information about them, like their name, age, reason for imprisonment and their current needs and mood. This may make it slightly harder for you when you may or may not have to execute them in certain situations. 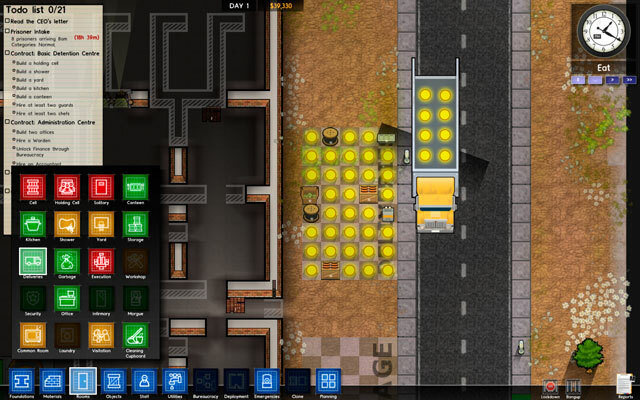 Overall, I think Prison Architect is an extremely good game with a lot of potential, and the team behind it are very impressive. I recommend this game to anyone interested in simulation games, or even interested in prison! The price of the game is relatively high considering it’s only in alpha and still has a lot of bugs, but if you should ever see it on sale you should buy it because when it is fully released there's a strong possibility that the game will be more expensive! So go on and buy it, make the next Alcatraz, or the next Guantanamo bay if you feel like being an evil architect!